This is the third and last post in a series all about tracing. First I convinced you that tracing is an awesome tool by explaining many of it’s benefits and addressing the main objections. Then I explained when and how to incorporate mindful tracing into your art lessons, including some thoughtful questions to help keep your brain engaged and learning while tracing. Today I’m explaining six methods of tracing. 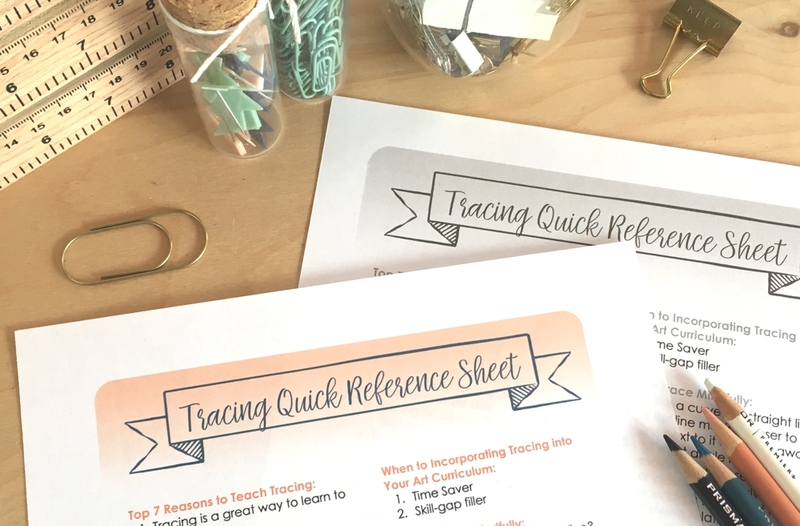 The main points from all three posts about tracing are summarized in this handy Tracing Quick Reference Sheet. It will help you remember each point and it’s great to have on hand when your art lesson includes tracing. It’s free for all our subscribers, so download it here! Now you know when to use tracing and how to coach the students during tracing, but what’s the best tracing setup for your classroom or homeschool room? Here are a few options to choose from- but first, I suggest you always tape the bottom paper and top paper to each other with a removable tape, like washi tape. This will prevent the two papers from shifting during the tracing process. Before you remove the tape, pull your tracing away from the light source and make sure you didn’t miss tracing any lines. I like to think of this method as the old-school method of tracing. This is how I learned to trace growing up and I still find myself using it for something super quick. 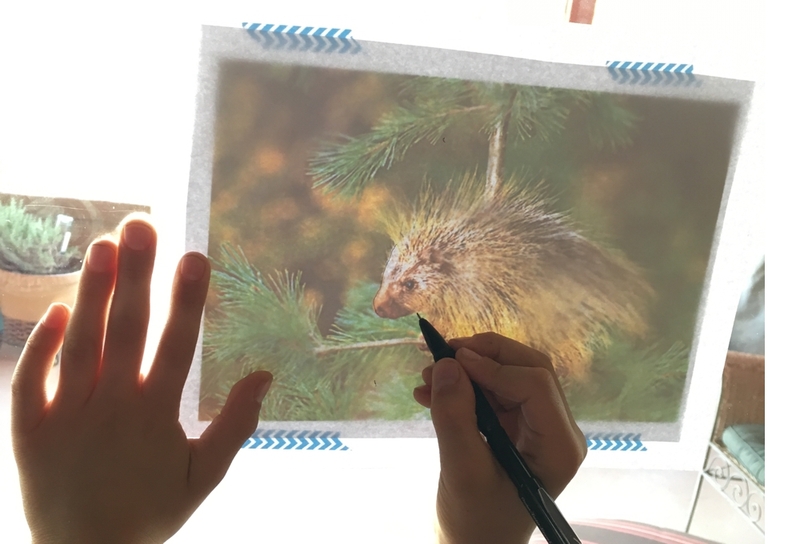 Layer a blank piece of paper over the picture you’re tracing, hold them both up on a bright window, and trace. This one is pretty self explanatory. You simply layer a piece of tracing paper over the picture you’re tracing, and trace. I know some teachers like to purchase deli wrap paper (the sort of paper you’d wrap a sandwich in) from Costco or Sam’s Club instead of tracing paper because it’s less expensive. However, you’ll need to invest a little time in cutting it down to a useable size. The downside to tracing paper is that it tears easily and it’s harder to see the finished image. To make the image easier to see when you’re done, tape or glue the tracing paper to a white piece of paper. This is my favorite method! In times past, light boxes (or light tables) were bulky and hot, but with all the new LED lights they’re thin like an iPad and cool to the touch, even after using them for hours. In fact, the industry tends to call them “light pads” now. Light pads are simply a hard surface with a diffused light source under it. What size paper do we usually use? You’ll want the illuminated surface to be at least that big. What power source will we be most happy with? I chose a corded electrical source so I didn’t have to worry about the extra weight or cost of a battery, but if you do a lot of your tracing away from an power outlet this could be annoying. If the light pad can plug into a USB plug, then it can also plug into a USB battery pack! Do we want a light pad with a range of brightness setting? My light pad is dimmable from 4700 to 30 lumens. I enjoy this feature more than I expected. When I’m working with thinner paper I don’t need the full brightness and it’s easier on my eyes to be looking at a dimmer light. However, when I pull out a piece of thick colored cardstock, I need the full brightness to see through the paper. Where are the buttons and will we accidently touch them? This is one question I didn’t know to ask myself. So, of course, my light pad has the dimmer button where my hand sometimes touches it as I rotate the light pad around. It’s a little annoying, but doesn’t change how often I use it. How unbreakable does the light pad need to be? If you’re handing the light pad to a younger student and not supervising them, you may want to choose a light pad designed for children with a lot of extra padding around the edges and an extra hard surface that’s not easy to scratch. A good friend of mine recently reminded me of this great little hack! You can download a free flashlight app. When it’s running, it turns your tablet device to an all-white screen, which makes it a lot like a light pad. I don’t recommend this method for a young student because it’s easy to press too hard and that might scratch the surface of your tablet! Put a picture into a sheet protector. Trace on it with an, Expo Vis-a-Vis Wet-Erase marker or a Crayola Ultra-Clean Washable marker (Expo Dry-Erase markers do NOT work). Spray it with a fine water mist. Lay a blank piece of paper on it and hold it there for 10 seconds. The ink transfers to the paper and you have a nice mirror image of your drawing. This is a fun, almost magical method of tracing! If you’re over 40ish you probably remember the old days of having an actual separate piece of dark carbon paper between the sheets of a multi-layer form. Nowadays when we have forms with multiple copies, it’s all baked into the paper, but you can still buy standard carbon paper like this. 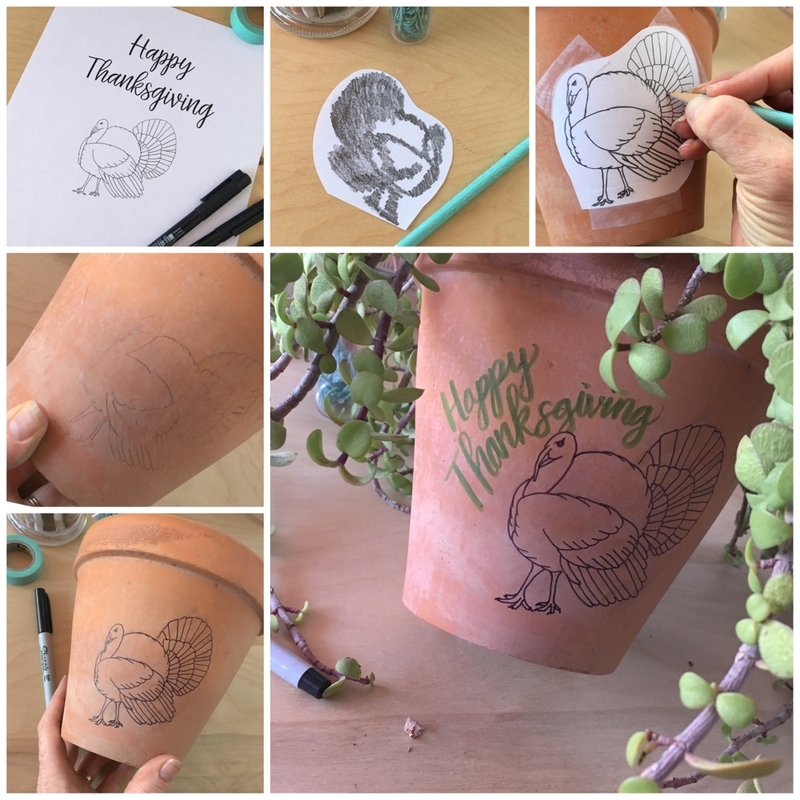 It’s fairly cheap, a lot of fun to use, and allows you to trace onto something totally opaque like a decorative ceramic plate, a terracotta pot, or a piece of wood. 1. Newspaper: You can use a piece of newspaper between your image and your surface. Be sure to grab a page that has a lot of ink and no shiny coating. To test it, rub your fingers around on it. Your fingers should look kinda dirty when you pull them away. 2. Pencil: You can make your own version of carbon paper by laying down a layer of pencil on the back of your paper. To do this, flip your image or drawing over so you’re working on the back side. Now hold your pencil almost horizontal to the paper and color back and forth, making the paper dark grey with pencil. 3. Chalk: If your project surface is very dark, lay down a layer of chalk instead. This, however, is my least favorite carbon paper equivalent because it can smears so easily, so be sure to help younger students when moving things back and forth. Also, keep in mind that some media (most markers and some paints) will not adhere to a surface covered in chalk. Be sure to test out the components of your project before you have a classroom full of students working on it! 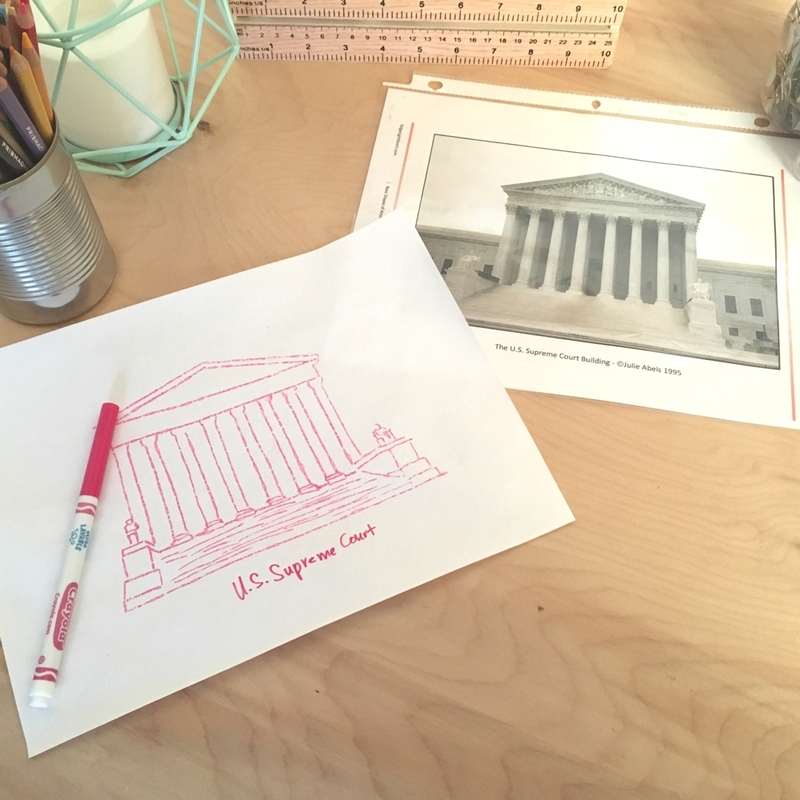 Layer the carbon paper or equivalent between the image and the project surface you want the image transferred to. Tape everything down before you or your student starts drawing so nothing shifts around on while drawing. Ready to take it to the next level? Try air tracing! This is an advanced method of tracing that’s hardly tracing at all. Air Tracing is when you look at an object several feet away, hold your finger out in front of the object, and ‘trace’ its lines in the air. You can also hold your pencil out and trace along the curves of an object. We often do this on a large scale when teaching our children their letters, but experienced artists know to do this when drawing from life. It’s especially useful when artists are drawing from life instead of a photo!